Optimus Pi: Stay on target - Sensors! Stay on target - Sensors! With my robot up and moving again under manual control I can turn my attention back to the autonomous challenges, something I didn't partake in last year's competition. With the release of the SenseHAT, as mentioned in a previous posting, I can just connect that up to the Raspberry Pi to get access to an acceleration and gyroscope sensor which will, hopefully, help keep the robot moving in a straight line during the three point turn and straight-line speed challenges. But for the proximity alert and line-following challenges I need something extra, and so for these I have chosen the VL6180 ToF Range Finder and Pololu QTR-8RC Reflectance Sensor Array modules. 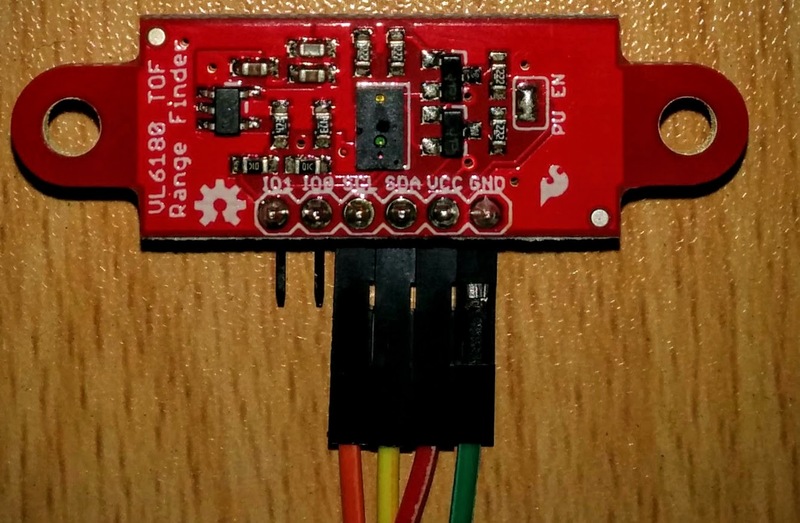 The VL6180 sensor communicates via i2c and supports an input voltage of 3.3v-5v so, after soldering on the pins, it can be connected directly to the Raspberry Pi. The module is provided with numerous resources, including the schematics, connection guide, Arduino library and, inside the Application Note, an almost complete C example of how to drive the sensor. So with a couple of tweaks to re-implement the i2c read/write functions using the pigpio APIs I have a test program (VL6180Test.cpp) that outputs the range every second. Reading through the documentation supplied with sensors is always useful as, in this case, I found out that the sensor becomes unreliable when the distance drops below 10mm. Something that wasn't explicitly noted in the description of the sensor. So when I mount this on my robot I need to make sure there's at least a 10mm gap between the sensor and the front most part of the robot to ensure it gets as close to the wall as possible. The QTR-8RC module contains IR LEDs to light up the surface being measured, and 8 different sets of sensors which, as there is a jumper to select 3.3V input, can be connected directly to the Raspberry Pi's GPIO pins. 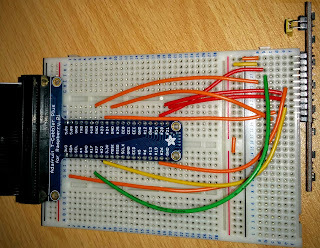 Again this module comes with instructions on how to connect it up, an Arduino library and various other documents which included the six steps required to take a reading from the sensor and I set to work writing a program to implement these steps. The sensor connected via an Adafruit T-cobbler. As this module was going to be more tricky to get up and running I decided to concentrate on getting a reading from one sensor first, and then extend the code to read from all eight. The first problem I ran into was not getting a good reading from the sensor, which initially looked to be caused by the IR LEDs not being turned on. 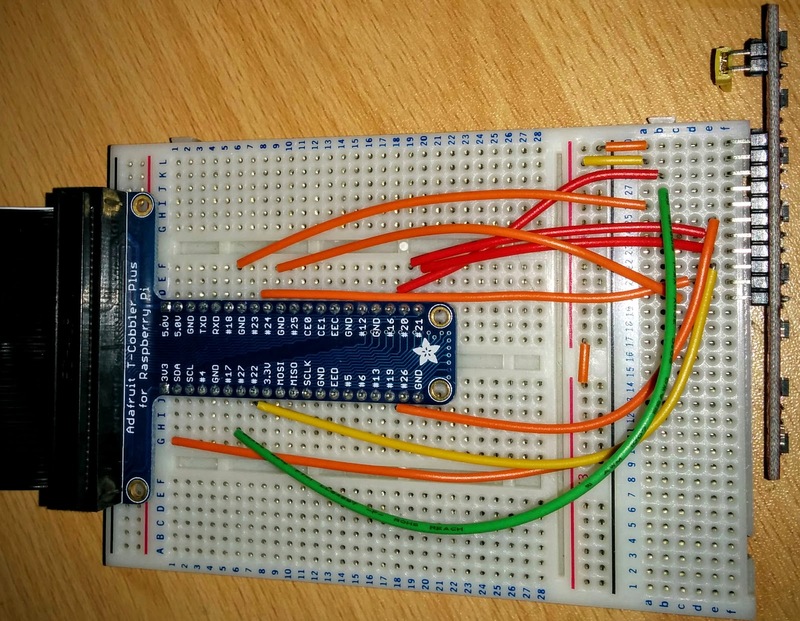 Having checked the code to make sure I was enabling the correct pin I decided to connect the LED_ON pin directly to the 3.3V pin to validate that the hardware was working as expected. Using the camera on my mobile phone I could see that the IR LEDs weren't coming on, so it was out with the multi meter to check the connections. The Raspberry Pi was definitely outputting 3.3V, but the sensor had a strange reading of 1.2V across its VIN and GND pins... Something wasn't right there and, after a bit more poking around, I realized I hadn't actually connected up the ground on the bread board! Luckily a harmless mistake and quickly rectified, with the IR LEDs immediately lighting up, so it was back to the code. I still didn't seem to be getting valid results form the sensor so it was time to read through the documentation again to see if I had missed anything. Aha! The recommend sensing distance was a mere 3mm, and my piece of test paper was much further away than that. Moving it closer and I started to see better results, my code was working! From that point it was just a case of extending the code to support all 8 sensors, tidy it up a bit, and soon I had a new test program that would output the state of the 8 sensors every second (QTR-8RCTest.cpp) . For some reason the first result always comes out as 'fully white' but the subsequent results are accurate, as tested by sticking some black tape on a white envelope and sliding it back and forth in front of the sensor. Now that I've tested and gotten both sensor modules working the next task is to decide how to attach them to the robot. My initial plan was to simple mount them on the front, but now that the range finder needs to be offset by at least 10mm, and the line following sensor has to be very close to the ground, I'll have to come up with something slightly different. Of course the more difficult task is to get the robot to actually use the sensors to drive itself around, something that I'm sure will keep me busy for the next week or two.